Palm Springs, CA, May 19, 2014 -- /EPR NETWORK/ -- The Neoclassics division of DiMora Motorcar® stunned the auto world with its unveiling of the DiMora Vicci 6.2 Emperor Convertible, at Art Revolution Taipei 2014 in Taiwan. 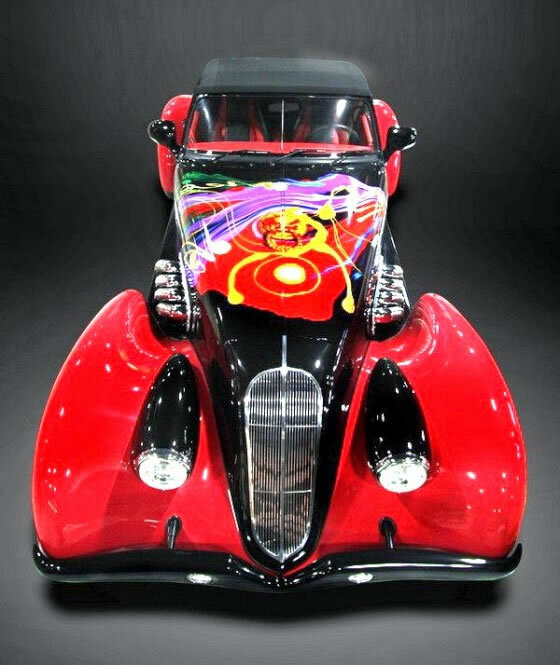 As the first product of a collaboration between America's automotive designer Sir Alfred J. DiMora and Taiwan's Zen Master Lee Sun-Don, this original idea has inspired not only the automotive world, but the art world as well, making it the first ever true rolling art. Two Vicci 6.2 Emperors sold at the exhibit for US $1 million each. A.R.T. Executive Director John Cheng praised the unconventional introduction of a new automobile at the art fair: "The DiMora Vicci 6.2 and Lee Sun-Don's paintings are the highlight of the show, and already enthusiastic customers have placed orders for two cars." Cheng was delighted to note the success of the art fair: "The fourth edition of Art Revolution Taipei closes with record sales. A record high of more than 93 percent of the attending artists have sold their works and several of them sold out completely. 280 artists from 48 countries around the globe showcased 2,000 pieces of artwork at the fair, including the eye-catching neoclassic DiMora Vicci 6.2 supercar that combines DiMora's handcrafted car-making art with Master Lee Sun-Don's powerful and striking painting." DiMora's production of the Vicci 6.2 Convertibles will have special editions of 25 Master Lee Sun-Don works on them. The original Great Treasure Gate paintings reflect Master Lee Sun-Don's continuing fascination with the distinctive door knockers created during the Ming Dynasty that lasted from 1368 to 1644. They have chosen these door knockers as a unifying theme for DiMora's limited run. 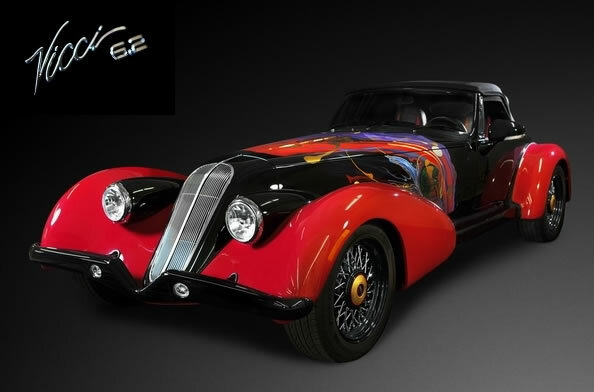 The owner of each car receives the original painting used to create the image on the automobile. "Development Unbound" is the title of the artwork on DiMora's first Vicci 6.2 shown at the A.R.T. fair. DiMora created the Neoclassics division of DiMora Motorcar to blend 430-horsepower 21st Century technology with automotive design cues from the Golden Age of Hollywood in the 1920s and 1930s. It then occurred to DiMora that the automobiles he was manufacturing with smooth curvature lines could be embraced by exquisite art. But it had to be the right match of artistic style for the combination to succeed. This would be uncharted territory, as never before in world automotive history had such an idea been tried. "DiMora Neoclassics is carving a path to an entirely different, untapped market," said DiMora. "Because of our trendsetting and out-of-the-box thinking, it only made sense to me to combine art with automobiles, to produce true rolling art." After many months of studying and comparing the work of numerous international artists, DiMora determined that Zen Master Lee Sun-Don was the right artist for the collaborative effort. Overcoming the language barrier, the two men quickly became friends with a common understanding of how to proceed. The DiMora Vicci 6.2 Emperor series of 25 masterpieces is the result. After Lee Sun-Don creates the original painting, meticulous care is taken to copy the image onto the Vicci. The core selection of 14 colors of paint are blended to produce the 50 colors that serve as the extended color palette of the car. Every detail of the painting is hand copied precisely into the outlines marked on the car. There is also a 51st color, but it is not paint. Some gold elements of the painting are actually gold leaf on the hood and side panels, along with the wheel hub caps on the Vicci 6.2 Emperor. Within the first hour of the opening of Art Revolution Taipei 2014, the first of the Viccis sold. The overwhelmingly positive public reception at the show of this innovative concept has led many art and automobile collectors to believe that a great investment in a DiMora Vicci 6.2 Emperor limited edition series will provide both appreciation and driving enjoyment for many years down the road. Based in Palm Springs, California, DiMora Motorcar excels in providing distinctive, limited-edition transportation solutions. The DiMora Neoclassics series of luxury automobiles includes the Vicci 6.2, now in production, and the Adina, now in the prototype phase. The magnificent Natalia SLS 2 sport luxury sedan is scheduled for production in 2017. Sir Alfred J. DiMora co-founded the Sceptre Motorcar Company, whose Sceptre 6.6S received Best-of-Show honors at the 1978 Los Angeles Auto Show. DiMora also founded the new Clenet Coachworks, Inc. in the 1980’s to continue designing and building the Clenet series of automobiles. When President Reagan declared 1986 the Centennial Year of the Gasoline-Powered Automobile, DiMora's Clenet was selected as the Official Centennial Car, resulting in honors for DiMora and the Clenet at the Automobile Hall of Fame in Michigan. Please visit www.dimoramotorcar.com or www.clenetclub.com. Complete specifications for the Vicci 6.2 Convertible may be found at www.dimoramotorcar.com/viccispecs.html. Inspired by his Buddhist practice, Zen Master Lee Sun-Don develops "totemic energy oil painting" to embody in Western oil art the profundity of Chinese culture and Zen sensibility. Born in Kaohsiung, Taiwan, Sun-Don has achieved international recognition as a music composer, pianist, Zen martial arts novelist, and Zen Buddhist Master of Yuan-Dao Guanyin Temple in Taipei. He currently serves as Art Director of Art Revolution Taipei and as Deputy Director of the Gallery of China Profiles in Xiamen, China. Galleries of his artwork may be visited in Beverly Hills, Hong Kong, Shanghai, and Taiwan. Please visit arts.sundon.net. The Art Revolution Taipei (A.R.T.) is an annual international art fair based in the Taipei World Trade Center. Detailed information is available at www.arts.org.tw. To purchase a DiMora Motorcar® Vicci automobile or any other DiMora products, please call 760-832-9070.